Using Space Engine for a D&D campaign? Hello everyone! I have been using Space Engine for a while and have been playing D&D for much longer and I recently had an idea for a D&D campaign using SE. I have been getting together a group to start a game of D&D with me DMing. So I want to ask you guys, how do you think it would work to integrate SE into D&D? The basic idea of the campaign is that the Players are controlling what is called a "Space Jammer", think the literal space sea-ships from Treasure Planet, and the players can use SE to go wherever they want in the universe (Although for story reasons they are confined to the Milky Way). The biggest issue I could think of with this is the massive book keeping that would be involved, however I think I can get around that by just figuring out an efficient way to organize everything. So what do you guys think? Can this work? Is there something you can think of that would make this better/easier? D&D as in Dungeons and Dragons? I also thought about this thing some time ago . D&D is an imagination game then you could use SE to make scenarios or for simulate travels whit the spaceships, but the characters must also have a concrete table of game that simulate the inside of a spaceship or a specific location on a planet for the battles or the exploration . The planet Abeir Toril, the setting for the Forgotten Realms campaign from TSR (D&D). Skinned over Mars in the Celestia software program. Planets made with Wilbur and cloud overlays I made to practice making my own worlds for a Homebrew campaign. 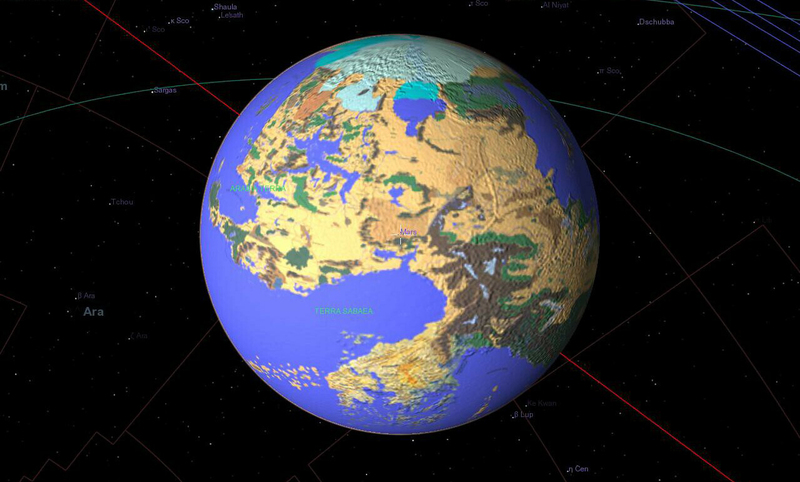 The map of Abeir Toril I would like to use in Space Engine, but I don't know how this coloration would work. I assume there is a bump map for elevations. I just haven't had the time to get into reading the very detailed instructions somewhere else on this forum. **If anyone feels in the giving spirit and could run it through the grinder, I would be indebted! Plain old TSR product map style colors. I managed to get a custom texture on the planet Toril, got the sea level pretty much where it should be and added some clouds. Next I will be working on a better bump map and a few night-side lights. Oh and the rest of the Realmspace system from the Spelljammer source books. Abeir is around a different star though. Yo Gnargenox, I love the Toril map! I have seen your images of it around the forum for awhile, but is it downloadable for SE? I am quite a fan of the setting. Jerry, I've perused your full globe-of-Toril construal from the Realms-list, and here's my take on it. Like our real Earth, Toril is an oblate spheroid rotating in the same direction as Earth does, around a tilted axis (as Earth has). Its distance from its sun is unknown, being roughly equivalent to that of real-world Earth (but affording some "wiggle room" to adjust climate and to a small extent gravity). 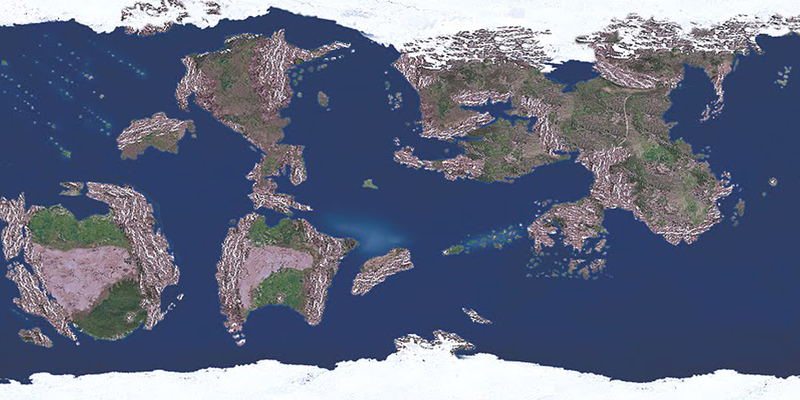 It's clear that the Heartlands of Faerun are SLIGHTLY warmer (higher temperature, longer growing season) than real-world Earth regions of the same latitude, but get a trifle colder in winter than real-world locales of the same latitude. In effect, discounting altitude- and wind-current-related factors, this is roughly equivalent to winter temperatures on Toril being about 5 degrees of latitude cooler than on Earth. In other words, Waterdeep at a little north of the 45th parallel on Toril averages the same winter-cold as does a Manitoba, Canada timberlands locale a little north of the real-world Earth's 50th parallel (though like any large city burning wood and peat and dung for warmth and cooking and industry, crowding people and livestock together, casting minor warming magics, and taking up slightly-warmer-than-winter air from Skullport and the Underdark depths, actual Waterdhavian street temperatures, when one escapes wind chill, can well be higher). The D&D rules postulate an environment as least as rich in heavy metals as our real world, so Toril must be as dense as our real world. It's clear from any close examination of my original maps, the Fonstad FR Atlas, and the ProFantasy Interactive Atlas, that Toril is larger than Earth. TSR designers over the years have estimated anything from ten to fifteen percent larger, and I corrected some of them (discovering along the way that map projections seemed to be a subject neglected in the early grades of some American schools) to show that they were correct in seeing about a five percent 'window' in size, but that the bottom figure couldn't be less than 12 percent. We settled on official agreement at twelve percent at a design meeting at the TSR offices after I pointed out that a larger Toril, given similar densities, has increased surface gravity and therefore the "Barsoom factor" (Hey, I'm a strongman! Watch me bend iron bars with my little fingers!) comes into play. That was something we largely wanted to avoid, as it affects not just musculature and body strength, but trajectories and therefore weaponry and spell effects and yadda yadda. :} So 12 it is. You came up with 14, which considering the slightly wonky maps in the Interactive Atlas, isn't bad. There is a way of putting a tiny 'wiggle room' in the density/metals problem, too, which is to have celestial-body calamities (asteroid/planetoid impacts) and plate tectonics shift more heavy metals near the surface in Faerun than are to be found elsewhere on Toril (hence some of the in-print, metal-avoiding daily construction materials and weaponry of Kara-Tur). This in turn can cause axial wobble and will tend to be 'smoothed and evened out' over the long run, but a thousand years of Realms game time is still but a passing geological moment. And yes, you can see from my comments here that I stand with the stated-in-print Waterdhavian latitude, so I'd follow the second suggestion in your article (to correct all the locations, rather than to ignore the difference in calculations that left Waterdeep 12 minutes south of the 45th parallel rather than about the same distance north of it). Placing Toril a trifle closer to its sun than Earth is to the real Sun gives us our warmer climes, and postulating a greater axial tilt than real Earth gives us our swings to and from severe winter at extremes of latitude. Some climate jiggering must take place to avoid howling, all-scouring and fairly constant winds in places, but we already know that such jiggering is taking place, in-game, because of the great southern reach of the Inner Sea North glaciers (a secret that was in the Realms from the first, and made official in the internal-TSR-publication-only "Realms Bible" I wrote years ago, but only officially revealed to the wider gaming public in the 3e Epic Level Handbook: Iyraclea in Appendix 1), and because of my carefully-planted lore about the Phaerimm magically monkeying with the climate (hence the spread of Anauroch). The slightly smaller size (12 versus 14) leads to a slightly smaller axial tilt than you arrived at, but by and large, your calculations are just fine, and you came to the same conclusions as the TSR designers did when they accepted my presentation all those years ago. Which makes the most valuable part of your article (the "What time is it in Waterdeep when it's such-and-such a time in Suzail?" and the hours of daylight bits) perfectly valid and very useful to all. Thanks, Jerry! Interestingly, years ago I wanted to include a very simple Sword Coast naval trading pull-out game in DRAGON, of about the complexity level of the old Milton Bradley childrens' classic PIRATE AND TRAVELLER, only with water hexes rather than specific game-track routes [but with paths of double-speed hexes for trade-wind-aided open waters], wherein players picked up specific cargoes [cards with values] in various ports and sailed around within the limits of a single sailing season trying to get richer than each other. TSR editors (right up to the Creative Director level) wouldn't bite, which was a pity because it would have settled so many of the sailing times/coastal road caravan times/merchant shipping questions, down the years. As part of this game, all harbours were to be marked, all islands (of course) named, reefs and 'wash rocks' located, and a little 'back story' Realmslore snuck in about the two competing methods of seaborne location (the elder meridian was through the highest peak on Tharsult, and the newer competing one through Mintarn). Regarding those islands you asked about: NDA clearance has been received, so expect my lore answer tomorrow. Source of the post Yo Gnargenox, I love the Toril map! I have seen your images of it around the forum for awhile, but is it downloadable for SE? I am quite a fan of the setting. It is not quite finished, as far as how much I first intended to complete for a released version. Then I realized I created about 20+GB of custom textures for everything not an asteroid or comet, including clouds and night time lights. Then I got side tracked on creating a Galaxy for it, but ran into the typical alpha channel problems with photoshop color management settings. It seems no matter what Gamma dot gain settings I use there is always a white film where it should be transparent. I will break down and use GIMP tomorrow. Yes, I went with 11 percent increase in size from Earth. (the quote you provided seems to state 14% was the first calculation they made, then reduced it to 12%). It ended up with 1.0G and the density is normal for a rocky world. Now that I see it is "official" I might bump it up to 12 percent in case anyone is measuring distances. I set Waterdeep at the same lat & long as London (Greenwich). 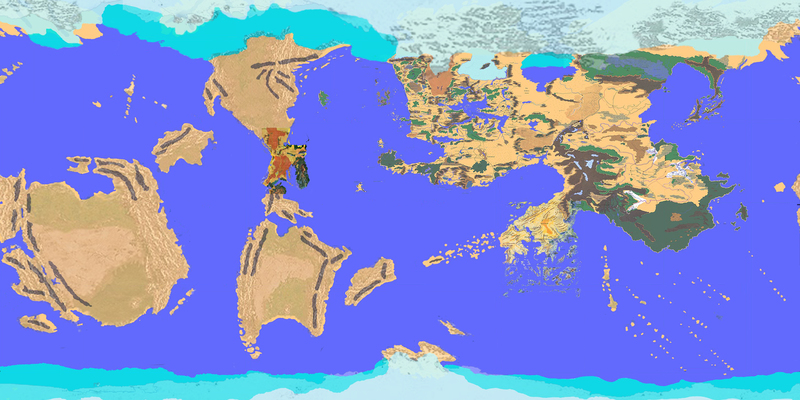 I also moved some continents around, to my taste, so if anyone were to compare they'd see some obvious differences. Other problems with the official maps is the southern nations of Al-Qadim are supposedly deserts but are very close to the south pole. I didn't change the scale to fix this. The biggest problem created by TSR was that nearly all their planet sizes result in planets with lunar strength gravity lol. I had to increase their size, rather than their densities and let the SE program recalculate their orbits or orbital periods. Right now I'm a little unorganized, once I figure a way to host a few gigabytes easily, clean up all my scripts, and write my descriptions for all the solar bodies, I will present it for download. I appreciate the extra info! Source of the post I set Waterdeep at the same lat & long as London (Greenwich). I did the same thing when I was making a cartographical map of Faerun way back when, with pen and paper. Making maps like that is certainly an enjoyable process, but yeah, doing it on a computer can be more finicky. One way to look at the Zakharan subcontinent is to treat it a bit like Australia, which is close to the south pole too and also hot and dry. True that within the setting, Zakhara is supposed to Arabian, and of course Australia has some complex geological reason for it being so dry (one of them is that it's essentially a giant mesa or plateau), but the logic I find works when dealing with quizzical players . Keep it up Gnargenox! This mod would be a dream come true for me. Source of the post You're speaking my language~! Speaking of language, I learnt A LOT about Zakhara this last year as it was the setting for a FR short-story I was working on. It was neat to learn that TSR had actually incorporated it into FR after they had published it separately in the 90s . It's a shame that not more was published about such a rich land. Do you still play d&d? The last thing I was working on a month ago or so was the Abeir-Toril relationship. It has been said that Abeir and Toril both share the same moon, but that you can not see one from the other. So obviously it had to be a trinary planet system with the "Moon" as the central body with Abeir and Toril as terran moons. Also added in the Tears of Selune, Trojans behind the central "Moon". The good news is since I figured out how to properly use barycenters, one object wont disappear if the other is out of view, they all behave properly now and you can view one or many without glitching. The snag I've been struggling with the past week or more is getting a PNG with a truly transparent background in the alpha channel for use in creating dust sprites in a custom galaxy. I use Photoshop 7, which not only is it free, but supposedly has better color management tools than later versions. I learned from poking around the internet that the way Photoshop handles alpha channels is severely lacking in tools. No matter how I mask it or insert it into, or create a new channel for it, the alpha channel always has this white to grey colored film rather than clearly transparent. Apparently it is a Gamma setting that Photoshop alters the values for when saving. I DID set my color management settings or color profile to match what my output needs to be, but no use. So I downloaded GIMP today, since I heard it can easily create transparent alpha channels in PNGs. I was hoping there might be a GIMP Guru lurking about the forum that can hold my hand and walk me through creating the proper PNGs for custom galaxies. ANY pointers would be very much appreciated!! Source of the post The last time I "played" was fleshing out an Al-Qadim campaign in Jan 2016. The really weird thing is, I stopped my D&D campaign in 2016 too! And to make it even weirder, I was playing a rogue/fighter hobgoblin named Lugburz Lugshud. It was for 3rd ed. Source of the post was hoping there might be a GIMP Guru lurking about the forum that can hold my hand and walk me through creating the proper PNGs for custom galaxies. ANY pointers would be very much appreciated!! Yeah, sorry about that. I was messing around with GIMP too for a digital poster. I found that YouTube was my savior. But it is entirely possible that someone else here could help you. After a two week break, I got down and FINALLY figured out how to make a proper alpha channel in GIMP. Things still don't look right though. I'm just glad I got rid of that milky white color correction in Gamma levels that Photoshop always left behind. Anyone know why the other channels (RGB) are so bright? PS This is going to hopefully be the galaxy I use where Realmspace will be located (and all future Crystal Spheres). I also realize I will need to split this into 2 galaxies so the galactic bulges are in the center of each one. I tried to make Krynnspace. It is not complete. And because I have no textures for the planetary surfaces, they are more or less random.